The Russian maker of the dual-screen Yota smartphone has signed a deal with a major Chinese electronics distributor to sell its latest YotaPhone 2 model across China this quarter. The first consignment for distributor Potevio is expected to be about 1 million units. The exact figures and the value of the contract haven’t been released. However, the contract is one of the largest between a Russian high-tech equipment supplier and a Chinese electronics distributor, the companies said in a joint statement. Potevio is to provide the marketing support for the YotaPhone 2 across the country. Under the deal with Potevio, the YotaPhone2 will come with a range of popular local Chinese applications, adapted for the phone's always-on screen, Yota Devices said. The Russian electronics maker said it has built a localized version of its YotaPhone2 that is designed to run on Chinese fast mobile broadband networks running long-term evolution (LTE). Yota Devices is one of Russia’s leading tech enterprises and was established in 2011. Two years later it unveiled a Russian-developed world-first double sided smartphone which includes an electronic paper display on the back. The second generation of YotaPhone was introduced to the public in 2014 at the Mobile World Congress in Barcelona. The Chinese leader Xi Jinping received the first phone after Russian President Vladimir Putin presented him a YotaPhone 2 during the Asia-Pacific Economic Cooperation summit in Beijing. Sales of YotaPhone 2 kicked off at the end of last year in Russia and 20 countries of Europe, the Middle East and Asia. In the near future YotaPhone 2 will appear in Indonesia, Latin America and North America as well. 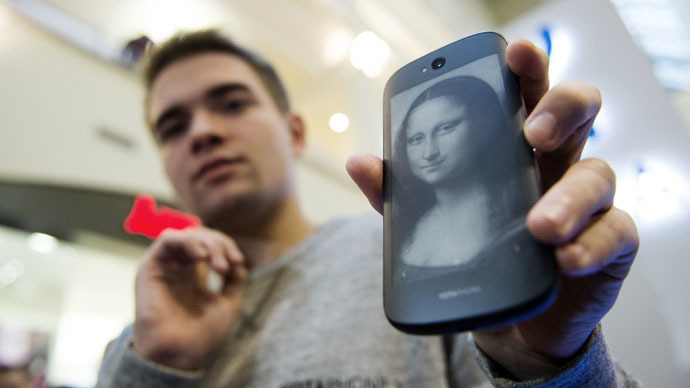 The YotaPhone 2 price rose from 32,990 ($500) rubles to 39,990 rubles ($600) due to the exchange rate fluctuations. Yota Devices has not disclosed its total sales of smartphones, but says 30,000 units were sold in Russia during December. Potevio is a Chinese state-owned business which manufactures and trades in telecom products, relevant technical research and services. Potevio sold 36 million phones last year with an annual turnover of 46 billion yuan, according to the company.